I asked Clare to do the hair and make-up at my wedding as she had worked on a friend’s wedding the year before when I was a bridesmaid, and we had all thought she was great. Throughout the whole process she was a pleasure to work with. We arranged a trial at my house a few months before the wedding and I was really pleased with the results but wanted to make a few tweaks nearer the time. I decided that I wanted to wear a hairband and change my make-up slightly and Clare adapted completely. She was a very calming influence on the day, but such good fun at the same time. I was absolutely thrilled with the results – I felt like a million dollars walking down the aisle. I would highly recommend Clare for both hair and make-up. Both the hair and make up lasted all night (yep, I was dancing until 2am, shoes still on, I was hobbling for day afterwards) and I completely forgot about topping up my lipstick and it still looks great in all the photos. Mum and the Bridesmaids looks great too - although my mum got her hat caught up in the sun visor in the car on the way over and the bridesmaid has to do a quick repair job for her, so funny, that'll teach her to have such enormous pokey things in her hat! Thank you for your email and thank you so much for making me feel special on my wedding day. Congratulations with managing all us brides this year. I am sure that you made them all feel as special as I did. My hair and make up was amazing together with Terry's mum's (she loved it!). Everyone is still talking about my hair and make up and it looked perfect on the day, really expressing the 1920s theme of the wedding. How exciting to be a bridesmaid (I hope you are getting someone to do your make up!). Thank you Clare for transforming me for my wedding. I felt at ease both during the trial and on the day. The hair and make-up were perfect and stayed all day, the compliments were never ending and I wouldn't hesistate to recommend you. I wish you all the best! 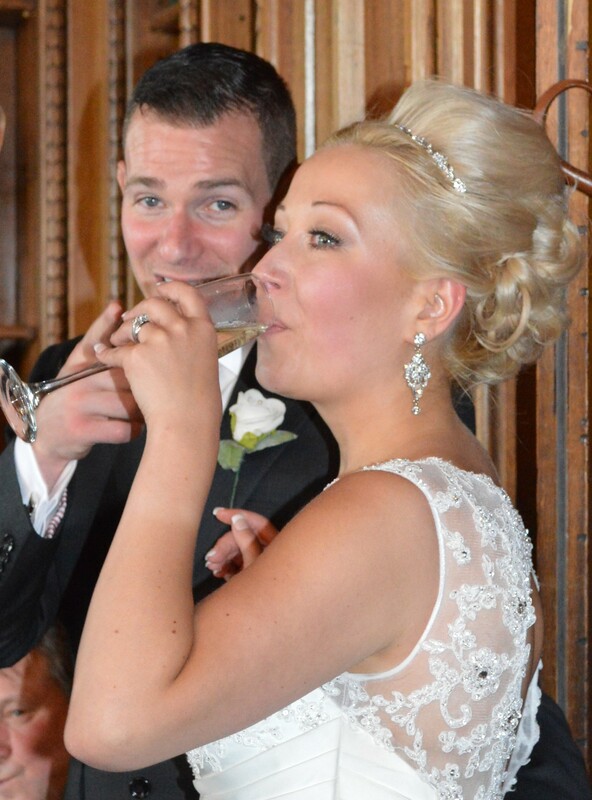 Having Claire recommend by an old friend, I was at first apprehensive as I had heard so much about how important it was to get the right make up and hair for your big day. Within seconds I had a brilliant feeling, she was warm, funny and above all else incredibly talented! With more makeup than I had seen in my entire life she transformed my face into something I had seen from a magazine, and my hair into what I had dreamed of! With a lovely open manner and extensive skill she transformed myself and my bridal party into a picture perfect group, which was a task and a half!!! My make up was amazing, and lasted all day with minimal touch ups, leaving me free to enjoy myself. Everyone commented on how lovely I looked, beautiful but not too made up, and my hair was amazing. All the girls who had hair and make up done were over the moon too and she made for some amazing photos! Cannot rate this girl highly enough... if I ever renew my vows, she's my girl! Thankyou so much for your skills to help me look a million dollars on my big day. Clare's style and talent shines through on her portfolio. I knew as soon as I saw her work that I wanted her to do the hair and makeup at my wedding. Before the wedding, Clare was amazing. We spoke about the styles that I was considering and she was really helpful, providing advice on how different styles could work with my dress, jewellery and sending me possible ideas. Our wedding was in Thailand and it was really hot on the day, but our hair and makeup stayed perfectly and the pictures were stunning. We looked beautiful and natural. I don't believe we could have had a better hair and makeup artist than Clare. She made the whole thing seem so easy, was completely professional and made the day and all the memories so special. Thank you so much Clare!